As 2016 comes to a close, I am confident even more achievements await in 2017. The foundation for success comes from INSTALL campaigns that are poised to deliver continued results – INSTALL training centers and installations in the south and west, increased specifications, concrete polishing training, increasing INSTALL Warranty Contractors and INSTALL Alliance Partners. In 2017, we will have more contractors and installers ready to service customer needs in FL, TX, TN, OK and CA. Across the USA and Canada, INSTALL contractors and installers will be supported by INSTALL certification requirements specified by a number of architectural firms, government, healthcare and educational groups as well as various manufacturers. Training sessions for concrete polishing are underway and will be available to many of our membership in the first quarter of 2017. Our continued success will depend on involvement by every member of INSTALL- partners, contractor and installers. Our training centers are great venues to work together to solve industry challenges. 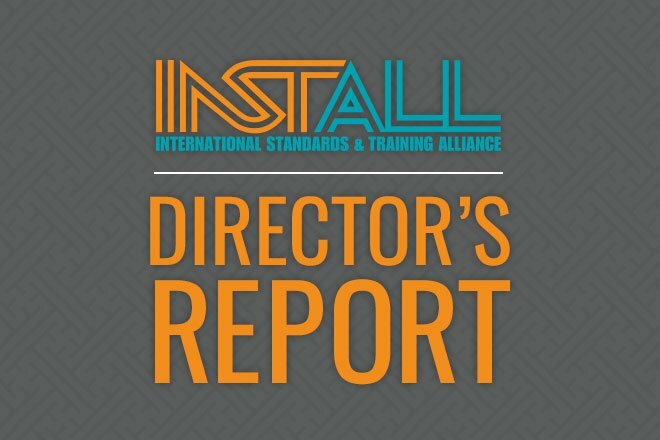 Please continue to promote and support INSTALL certification specifications, earn every INSTALL certification possible and continue with career-long installation training. We have earned the opportunity to be recognized as the standard bearer for the floorcovering industry in the USA and Canada.